Qingdao is a coastal city on the yellow sea in the south of the province of Shandong and faces to South Korea as well as to Japan. Qingdao is one of the China's first batches of best tourist cities, due to its countryside, which is surrounded by sea and mountains. Because of its past as a German colony, Qingdao is famous for his International Beer Festival, held in the last 2 weeks of August. Furthermore the city is famous for the world´s largest sea bridge, the Jiaozhou Bay Bridge, which links the main urban area of Qingdao with Huangdao district. 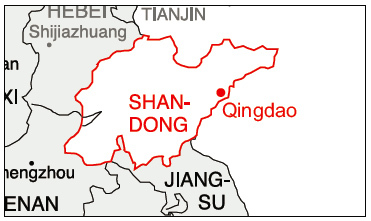 Qingdao is arguably one of the most important cities in Shandong. The Qingdao Liuting, former civil aviation airport, is located 31 kilometers from downtown Qingdao. The airport has been used since 1982, mainly by China Eastern and Shandong Airlines. However, in December 2013 the government approved the construction of Qingdao Jiaodong International Airport, which will be located 39 kilometers from Qingdao, in Jiaodong (Jiaozhou), and will replace Liuting as Qingdao´s main airport. Located in center of Shandong Peninsula, Qingdao is one of the busiest ports in the world. Since it was founded in 1892, trade has rapidly increased and Qingdao is now trading with over 700 ports all over the world. Qingdao Railway Station was built in 1900 and nowadays there are hundreds of trains heading to main cities and provinces in china, such as Beijing, Shanghai, Guangzhou, Xi´an and other 13 locations. However, the main line is between Qingdao and the capital city of Shandong Province Jinan handling over 990 million passengers per year. Nine expressways and 4 National Highways pass through Qingdao. The roads have total lengths of 14,326 km including 700 km expressways. Main highways include the Jinan-Qingdao, Jiaozhouwan and the Qingdao-Yinchuan expressways. Qingdao’s Subway has been under construction since 2009, and includes two phases. In total 7 lines are planned. The first lines, Line 3 and Line R1, are expected to be completed in summer 2015. In addition, Line 2 is set to commence operation in January 2016. Four lines are planned for the second phase, with the first line becoming operational in April 2017. Line R3 has a set completion date of December 2017 and the last two lines will become operational in February 2018. Qingdao is the wealthiest city in Shandong and is viewed as a port, brand, tourist, marine science and technology city. It makes effort to build advanced manufacturing, industrial base, hi-tech industrial base, modern service industrial base, regional economic center, north east international shipping center and national marine research center. The main industries in Qingdao are electronics, communications, information and electric home appliance, chemicals and rubber, food and beverage, automobile and ship building and garment and accessories. Qingdao is also home to many famous Chinese brands. These enterprises account for more than half of the city’s total economic aggregate. However, state-owned enterprises are still the mainstay of famous brands, including Haier, Hisense, Double Star, Jifa and Tsingtao Beer. Qingdao is also famous for its marine-tech research power in China. Almost half of the national marine researchers and research institutions are located in the city. Foreign invested enterprises Qingdao are subject to an income tax rate of 25 percent; however in specific industries such as agriculture, forestry, animal husbandry, fishery and sideline projects and income from environmental protection exemptions and reductions may apply. Qingdao has nine development areas: Qingdao Huanhai Economic Development Zone, Jimo Economic Development Zone, Jiaozhou Economic Development Zone, Jiaonan Economic Development Zone, Pingdu Economic Development Zone, Laixi Economic Development Zone, Jimo High-tech Development Zone, Chenyang Industrial Park, and Qingdao Port Industry Processing Zone. In addition, six economic parks are being planned:JiaozhouYanghe Equipment Manufacturing Area, Jiaonan Dongjiakou Heavy Chemical Industrial Area, Jimo Longquan Auto and Parts Industrial Area, Pingdu Xinhe Chemical Industrial Area, Laixi Jiangshan Light Industry Area and Jimo Nudao Shipbuilding Industrial Area. Qingdao is a famous natural port, foreign trade port and a shipping hub on the west coast of the Pacific Ocean. As China's second largest port in terms of cargo throughput, Qingdao Port also operates Asia's biggest crude oil terminal and the world's top iron ore terminal. With 70 productive berths, 24 of which are deep sea water berths for vessels of over 10,000 dwt, the port has 97 international shipping routes that connect Qingdao with more than 450 ports around the world. Currently seven Fortune 500 companies have established subsidiaries in Qingdao Port, including Mitsubishi from Japan and ABB from Sweden. Established in 1984, the Qingdao Economic and Technological Development Zone was one of the first 14 national-level economic zones approved by the State Council. It occupies a total area of 20.2 square kilometers. The zone has an excellent transportation network and is linked to three expressways. Accessible from downtown Qingdao either via expressway or sea routes, it is about 24 kilometers to the city by sea and 66 kilometers by expressway. Trips to the city take approximately 30 minutes via ferry or 12 minutes via speedboat. It is 53 kilometers to the airport (approximately 40 minute drive). The Huangdao Train Station is also located in the zone and connects to the entire national rail network. The station has 26 regular trains, transporting a total of 30 million tons annually. Established in 1992 and located in the eastern part of Qingdao city, the park covers an area of 16.7 square kilometers. The park comprises the Hi-Tech Product Export Base, Biology Valley, University Science Park, Software Park,HuiteIndustrial Zone, and more. The park is in a central location with Qingdao’s new downtown to the west, Laoshan National Park to the east, and the beach just 12.5 kilometers to the south. It is also situated just 12 kilometers from Qingdao harbor, 15 kilometers from the railway station, and 17 kilometers from the airport. High-tech industries and enterprises are concentrated in the northern part of Qingdao Hi-Tech Park. Universities, institutions, research centers and a residential area make up the central part, while the southern part of the park consists of a resort area and tourist attractions. The park is ranked third among the 52 high/new technology zones of its kind in China. Established in 1992, the Qingdao Free Trade Zone is the only bonded area in the Yellow River basin and duly receives preferential treatment. Covering an area of 3.8 square kilometers, the area enjoys being certificate-free, tax-free and bonded, among other special policy treatments. The Qingdao free trade zone follows the model of the standard Free Trade Zone in China and enjoys a series of preferential policies including tax rebates and smoother registration processes for imports and exports, tax exemptions and special policies for export trade processing, and bonded warehousing. The zone has attracted international investors from over 40 countries as well as domestic investors from over 20 provinces. There are more than 2,000 investments, of which almost 1,000 have come from foreign, private, and joint ventures. Total contracted foreign investments have already reached USD 160 billion.